This morning I am at a complete loss for words. Just when I thought the market couldn’t get any more insane, Toronto proved me wrong. I don’t even know how I am going to explain this to would-be buyers hoping to buy something in this market. Sure, I always tell them they are likely going to have to overpay to win a bidding war, but this sale last night is making me question everything. The writing has actually been on the wall for weeks. It started with a sale just down the road at Bloor and Symington. A town home, on Bloor itself, in a sketchy area, sold for $754,000! While this may not mean much to anyone that doesn’t follow the market, just 3 months ago an identical unit sold for $660,000. This unit has builder finishes and with no signs of renovation to top it off. That is a 14.24% increase in less than 3 months! Or you could look at it another way, a single buyer was willing to pay 14.24% more than the last sale. The very next things got even more weird when a 1+1 condo at King and Portland, sold for just shy of $1000/sqft. The 900ish square feet, not even 2 bedroom, previously at $639,000 and sold for a seemingly mind-blowing $892,000. My first reaction was shock with this sale, but after doing some research it actually started to make sense. The $639,000 list price was EXTREMELY low considering the neighbouring, similarly identical unit, sold back in 2015 for $653,250. 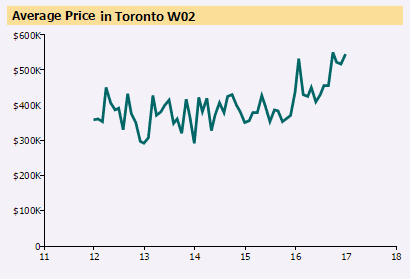 So given the increases in average price of a condo in C01 of 16.6% from the time of that sale to January 2017, technically the condo has a market value around $760,500 which is already $100,000 more than the list price. But not only did the sale price surpass that value, it blew it out of the water by a further $131,500. The only reason why I am less shocked with this one though is it is in a desirable location, and has an amazing terrace overlooking Portland Ave. with a view of the nearby park. Then yesterday happened. A condo at Dupont and Lansdowne, not exactly King West, received an incredible 37 offers (as of yesterday afternoon) sold for a heart-attack inducing $157,000 more than the most recent comp in the building which was an identical unit which had sold last June. Based on the sales numbers this works out to a 49.2% increase in value from the time of the last sale to today. Even if you tried to come up with an average price increase for the area during this time which works out to a 33.13% increase (trust me these numbers are heavily skewed due to there only being 7 sales in January), the buyers still paid an extra $50k over this skewed market value. To put this in perspective, this buyer got a 600ish square foot 1 bedroom condo with Coffee Time as its neighbour. Who the heck other than people who have completely given up on life or have zero taste buds go to Coffee Time for their coffee? I sincerely hope these buyers have plenty of cash because I doubt any of these properties appraise. While my job is to help my clients get the condo they want, I just can’t recommend someone pay that much over market value. Last year I sold a condo that was about $25,000 over market value and I felt horrible telling my client that this is what I thought it would take for them to buy the place in a multiple offer scenario. The condo market has changed, and if you are a buyer right now, you are in for some surprises. On the other hand, if you are a seller, there has never been a better time to sell. If you’d like to get an idea of just how much someone might pay for your condo in this market, just contact me below.